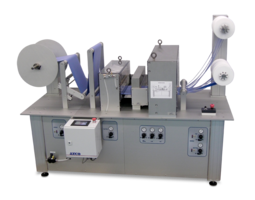 Heat Seal Station comes with custom cut-to-length knife assembly, controller and an idler roller for unwinding roll of material in to the station. 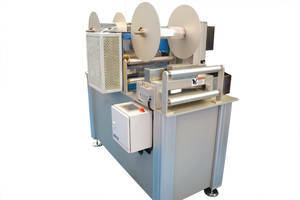 Unit’s controller allows user to change the length and width for larger pouches and to control the impulse sealer. Mounted on 1/2 in. thick aluminum plate, seal station features HMI touch screen for set up and operation. Unit is designed with two sensors that senses material presence and automatically shut downs when no product is present. Fairfield, NJ - March 28, 2018 – AZCO Corp. has designed a custom cut-to-length knife assembly with a sealing bar to make bags from poly tubing. This is ideal for replacing pre-made pouches. 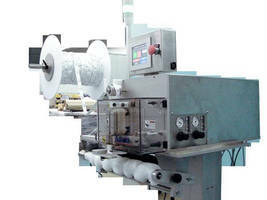 The roll of material is guided from an unwind into the heat seal station by an idler roller. You can vary the length from the controller or change the material width to get larger pouches. The controller controls the impulse sealer creating a permanent seal. After sealing, the material is cut to length. An operator uses the color HMI touch screen for easy setup and operation of the unit. The entire station is mounted on a ½” thick aluminum plate. Two sensors are provided to ensure that material is present entering the rollers and exiting the knife assembly. Unit will automatically shut down when no product is sensed. AZCO Corp. is an ISO 9001:2008 certified company with over 34 years of experience developing solutions for a wide range of feeding and cutting applications. 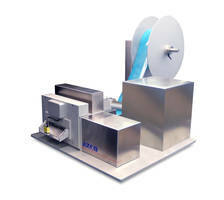 AZCO Corp. will provide the most efficient and cost effective solution for you. Made in USA. 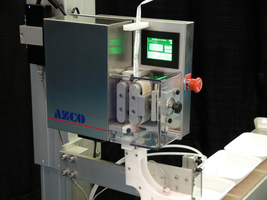 Pouch Dispenser features motor-fed precision cutting.